Buy Local - Made from our alpaca fiber! Price includes $3.00 shipping fee via USPS First Class Mail. If you desire to use Priority or Express Mail Service, please call for shipping charges. If ordering more than 1 item, we will combine the items and ship the group at the lowest cost for the selected service. We ship within 1-2 business days, with the exception of holidays or any days that the US Post Office is closed. Made from Wild Rose Suri Ranch alpaca fiber! 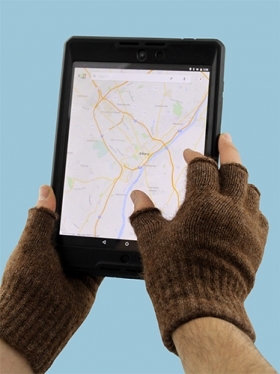 As touch screen cell phone use is on the rise across the country, it's important for people to have the option of alpaca warmth while staying connected! These gloves give you flexibility while driving or doing outside chores with the freedom of being able to use and feel with your finger tips. 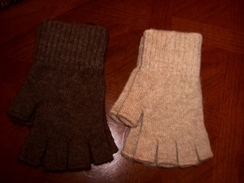 They can also be used as glove liners to increase the warmth of your mittens or gloves with fingers. These Fingerless gloves are mid-weight and are made from our own alpacas' fiber. They are 80% alpaca and 20% nylon for durability. The fingerless gloves are made from natural fiber from the natural colors of the alpaca: white, fawn (tan) and brown, and come in sizes from small through extra large. They make a great gift of warmth and comfort!